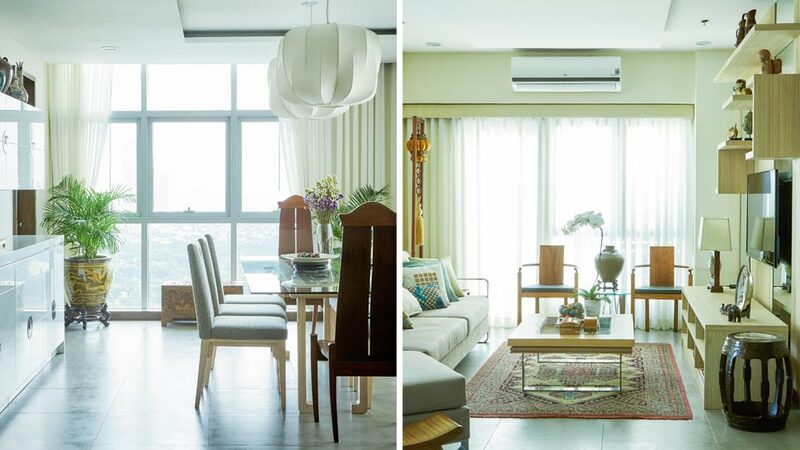 As a family accustomed to living in a condo, the owners of this home only had their eyes set on a newer unit after spending years in one of the early condo developments in Ortigas. They initially purchased a combined unit, but found the layout inconvenient. Luckily, they saw this penthouse in the same building, and things started falling into place. The couple tapped MCD Architects for the floor plan and decorator Gwyn Guanzon for the furniture and decorations. Gwyn happened to have worked with them in their former house for a minor renovation. This time around, Gwyn’s design challenge was to incorporate all the heirloom pieces the family owns, anchoring on a fresh and new vibe. The result is a mix of antique Chinese ornaments set against muted colors, contemporary furnishings, and pieces that the decorator designed himself, produced by Asian Tropical Living Inc. Knowing that the family is big on entertaining guests, he focused on making the dining area spacious, comfortable, and with a lot of seating options. Read the original article ("China Chic") in the October 2016 issue of Real Living Magazine. Download your digital copy of Real Living on the Real Living App. Log on to summitnewsstand.com.ph/real-living for more details.